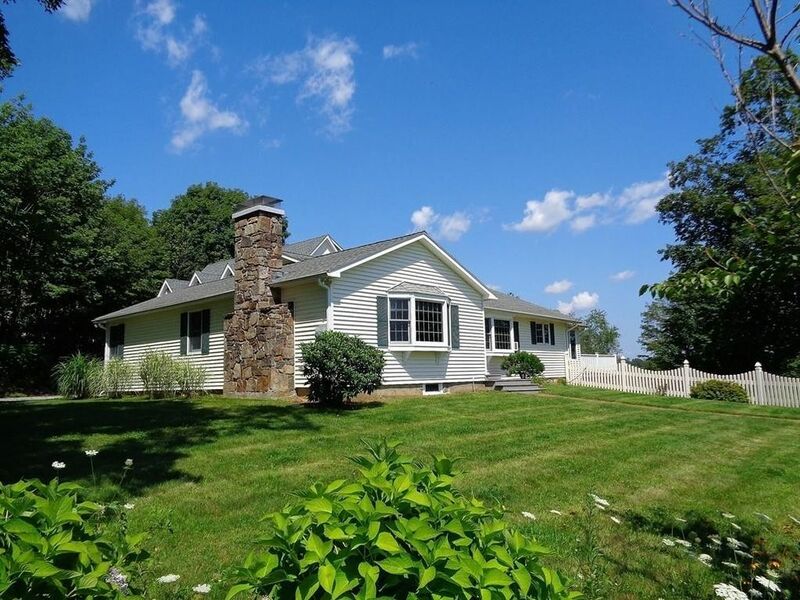 Lovely Executive Ranch with a serene, scenic view and a 3 car garage of your dreams! Age in place with one level living! CUSTOM, 3 BAY, INSULATED & HEATED GARAGE w/separate 200 amp panel,(3) 240 volt outlets, storage closet, set sink & room for 5 cars (APO)! Garage with full walk-up 2nd floor w/vaulted ceiling, 3 dormers, lighted cupola, plumbed for a kitchenette & 3/4 bath! HUGE mudroom entry w/double closets, farm sink wash station w/granite counters & laundry closet w/washer & dryer. Fully applianced, eat-in kitchen w/under cabinet lighting & granite counters. Spacious sunroom w/French doors leads to a new Azek wrap-around deck & STUNNING VIEW of the woodlands & distant hills.Charming dining room & family room have bay windows, HW floors, wood burning fireplace & custom built-ins. Master bedroom has 3/4 bath w/glass shower.Updated roof, furnace, windows, oil tank, elec panels, custom blinds, French drains, siding, NEW 4 BR SEPTIC, well, filtration system & 1 car under garage door! Directions: Warren Rd (Rt 19N) to Tower Hill Rd. Please park in stone driveway, in front of garage.